My hand got an itch to talk about the recent controversy related to my hometown and a not-so-bright girl from the other side of Malaysian map that, I think, pop out just last night. About two years ago, there is also a boy, well practically a grown man with a mindset of a boy, name Luca Lucas who have also post several (or should I say a lot of) incriminating comments that angered Sabahan on a Sabahan (I think) Facebook page. He had since apologize to all Sabahan. I, as a loyal Sabahan have forgiven him on the day he apologize. But he will never be forgotten because he is one of the first few pioneers to say such irresponsible and unacceptable things to belittle Sabahan and Sabah as a whole. Here is the thing about my beloved state, Sabah may be the poorest state in Malaysia (before Kelantan as it is said - not by me, as poorer than Sabah). But that doesn't mean that we are really poor. Our state is deemed poor because the lack of development, not much of good facilities and infrastructures. Our state have a lot of poor residents that classified as 'miskin tegar' by the government, but that doesn't mean that we are completely poor & hungry. Those Sabahan that deemed poor, own at least a piece of land and use the land either to grow crops & palm tree, rubber tapping or some might rent a small lot to communication company such as Celcom to build their 'tower' or whatever they are called. And food is always accessible for them. They don't need to pay taxes (but there are land tax I was told) or any sort. They still able to keep money to wed their children. Some children might not be able to go to school, not because they couldn't afford school (government does supply clothes, shoes, stationery and books), but because school are far away or they don't see how important education is. They rather learn practical lesson than education. I am not saying their way of thinking is right, but you would not have much option either if one of the several reason is when the school is 3 or 5 hours away on foot from your home. Sabah is also one of the 4 state in Malaysia that produces oil & gas. OIL & GAS for Godsakes! And some illiterate dimwits dare to say us poor? If any of you readers are curios as why Sabah is still listed as second most poorest state in Malaysia when we have such expensive resources, let me tell you here: 95% profits from the oil & gas from Sabah will go to Federal Government or many of you would know 'Kerajaan Pusat'. Sabah will only get 5% of the profit to build every single thing we have on this land. I won't say further on this topic because I promise myself not to talk about politics in my blog. Despite of our lack of development, Sabahans are still happy that we have one of the biggest virgin forest area in the world - not to forget, one of the oldest! Mount Kinabalu is the highest peak in Malay Archipelago (place 20th in the world) and stood proudly on the crocker range of Sabah. Protected as Kinabalu National Park and a well known as well as acknowledged World Heritage Site. Huge varities of discovered as well as undiscovered flora and fauna, marine life, and sceneries to explore. Sabah is ugly place to be? That gave me a hefty laugh! Would all those lao wai (foreigners) come here just to see ugly land, full with ugly people that have ugly manners and ugly hearts? 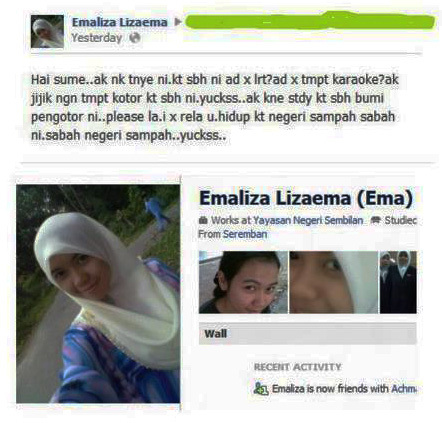 I wouldn't say we don't have people with ugly heart in Sabah because there should be several in every place on Earth. Oh yeah! Not to forget, we have plenty deep sea fishing spots that all those crazy deep fishing goers are willing to spend thousand just to experience deep sea fishing experience in Sabahan's sea. Pulau Tiga, one of the most beautiful and unique island that became the first selected spot and filmed for the first season of the USA's reality show the Survivor series. Another unique island that is so spectacular, though I myself haven't been before, is Pulau Sipadan. Said to be an untouched natural art, the island formed by living corals growing on top of an extinct volcanic cone that took thousands of years to develop. God is in a mood of art when He created Sipadan!! We are not sure yet if Miss Emaliza Lizaema's Facebook page is hacked or impersonated by some irresponsible party. I would really hope it was an act of treason by irresponsible party and not Miss Emaliza Lizaema herself. Such beautifully sweet looking lady wouldn't be such foul-mouth or in this case, brainless. Right? Research your fact before saying something that you've never know about and regretted in the end. This controversies have nothing to do with race or religions. But there are people, especially those with stinking racist/discriminating/ignorant mind out there will not help themselves but mentioning how this girl with Hijab but don't have the proper manner to pair with the religious covering. But if I have not known better, I would be thinking the same. But in Sabah, all race mingle with each other very well. Well with exception of immigrant (PATI/PTI). So I have quite a knowledge (though not perfect) to understand that your action does not necessarily portray your whole race and the whole faith community of your own. Hijab is not necessarily a must wear costume for women in this country but absolutely a must in Islam. Every woman who wear Hijab is not only showing respect to her husband or future destined, but also showing herself respect not to flashing awrah (aurat) to the public. Women who wear Hijab are good women. Though some woman will use Hijab not to cover themselves but to cover their evil, sins and wrong doings. They might not be necessarily a good person, but definitely a good women. After all, nobody has the purest soul but Allah (God) Himself. - And this agree. Part of her words about Hijab are almost like the expression of the phrase "no amount of makeup can mask an ugly heart". But her words are more meaningful and serene. Since then, I do not view Hijab as something that Muslim women were force to wear. But a pride for themselves and as a part of who they are. With the understanding, I come to respect them even though how bad the girl with Hijab would be towards other people. p/s: I wonder where is this favorite friend of mine went to since we part about 5 or 6 years ago. With that I conclude my post. UPDATE 24 Aug 2012: Just found & read a blog post saying the Facebook account of Emaliza Lizaema was indeed hacked and compromised by an irresponsible unidentified person/people. The blog is a Bahasa Melayu and click here to read. A police report had been made by the girl but police advised her not to upload the report for some undisclosed reasons. Here is what made me more curious, whenever a Peninsular girl/guy 's Facebook or twitter account was hacked, the hackers will angered Sabahan with some irresponsible statuses. Were the hackers actually is the same person? Why made Sabah as a target anyway? Oops! accidentally deleted the comment. But yeah I agree. only 5% to distribute to 25 Sabahan district. Imagine what happen when Sabah don't have those resources anymore?